On August 2, 2018, State Councilor and Foreign Minister Wang Yi held a bilateral meeting with Foreign Minister Taro Kono of Japan on the sidelines of the Foreign Ministers’ Meetings on East Asia Cooperation in Singapore. Wang Yi noted that Premier Li Keqiang’s successful visit to Japan, the first one paid by a Chinese premier in the past eight years, has promoted China-Japan relations for improvement. Prime Minister Shinzo Abe has repeatedly expressed that the two countries should translate competition into coordination, which shows the positive changes in the Japanese side’s cognition of China. 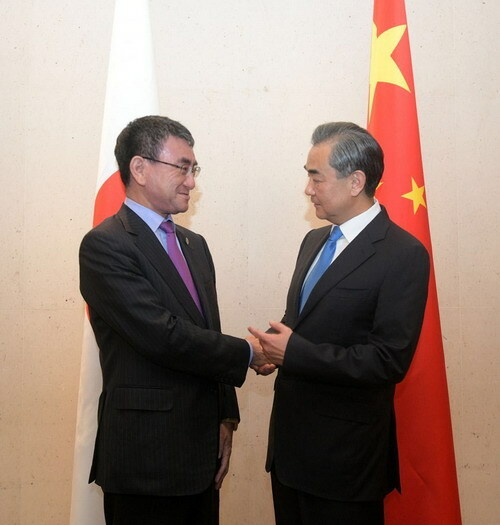 As this year marks the 40th anniversary of the signing of the China-Japan Treaty of Peace and Friendship, both sides should review the experience and lessons learned from the development of bilateral relations over the past 40 years, and earnestly consolidate the political foundation for bilateral relations set forth in the four political documents between China and Japan. It is hoped that the Japanese side could cherish the current hard-won momentum of improvement, properly handle relevant sensitive issues, constantly increase positive energy, and eliminate negative interference, so as to ensure that China-Japan relations will continue to develop in the right direction. The Chinese side is willing to, together with the Japanese side, speed up the comprehensive implementation of the consensus reached by leaders of both countries, and strengthen practical cooperation in such fields as high technology, innovation and third-party market. Taro Kono expressed that Premier Li Keqiang’s successful visit to Japan this May has brought Japan-China relations back to the normal track, and bilateral cooperation in economy and other areas has witnessed sound progress, with which the Japanese side is pleased. The Japanese side stands ready to make further efforts to earnestly implement the important consensus reached by both sides, strengthen high-level exchanges, and promote cooperation in such areas as innovation and third-party cooperation. It is hoped that both sides will actively enhance youth exchanges, and create a sound social foundation for the sustained development and improvement of bilateral relations.